For those who love open air holidays but don’t want to give up the comforts of a hotel, Residence H. Joker features studio apartments with two twin beds (third and fourth beds - bunk bed or/and rollaway bed) kitchenette with kitchenware and fridge, private bathroom, telephone, safe, television, lift, balcony with table and chairs. All rooms have air conditioning and heating . 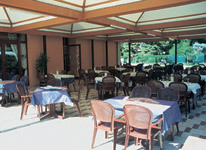 Our guests can also enjoy our Ristorante Pizzeria with its wide covered terrace and a large underground parking. This is the ideal holiday accommodationfor those guests who prefer lodging in the Residence while enjoying the atmosphere of the Village and all its facilities. One-room apartment with 2 single beds and a folding-down bunk-bed. Parking place in the underground garage included. Restaurant/Pizzeria with a large terrace. All linen is included in the price. Free access to all campsite facilities.